The artworks of an eminent father and son form the center of a striking exhibition that recently opened at Tokyo National Museum. On show in “Fusuma Paintings of Jukoin” are rare works by Kano Eitoku (1543-1590) and his father, Kano Shoei (1519-1592), which have been designated as national treasures. Considered to be masterpieces of Japanese decorative art, the principal works in the exhibition date from the late Muromachi Period (1392-1573). The grand scale of the paintings — there are no less than 46 of the exquisitely decorated sliding wall panels known as fusuma — presented an unusual challenge. The museum has risen to it in style, however, meticulously re-creating the layout of Jukoin Temple’s main rooms and thus displaying the paintings in authentic surroundings. 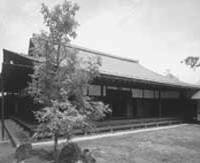 A sub-temple of the large Zen monastery Daitokuji in Kyoto, Jukoin was founded in 1566. The temple is most famous as the burial site of the great tea master Sen-no-Rikyu (1522-1591). Given the temple’s association with Rikyu, it is only appropriate that his prized tea ceremony utensils are also included in the display. Buddhist temples — and powerful secular lords — often commissioned well-known artists to paint decorative scenes on fusuma panels, which are traditionally used to partition rooms. The resulting artwork was an essential element of the interior decor of these rooms. The favored medium was ink painting, introduced from China in the 13th century. Until the late 16th century, Japanese artists closely followed the style and subject matter of the Chinese masters. Kano Shoei was particularly skilled at depicting Chinese-style landscapes, and a wonderful example — “Eight Views of Xiao and Xiang,” an imaginary vista of the Xiao and Xiang rivers — is on show here. The four panels are rendered with a delicate gradation of ink. The blank space on the “canvas” is evocative of a panoramic view of a distant waterscape, inviting viewers to enter the illusory world of the painting. Though the close echoing of the works of Chinese masters in the art of Shoei and his contemporaries indicates Japanese artists’ fascination with Chinese styles and motifs, Shoei’s son, Kano Eitoku, would break with tradition and his paintings are particularly admired for the way in which they convey the dynamism of nature. Eitoku’s 16-panel “Birds and Flowers of the Four Seasons” is a masterwork that the artist is believed to have completed at the age of just 24. The painting is executed in broad brush-strokes and has an energetic composition with unpainted areas that serve to highlight the natural features it so meticulously depicts. The seasons unfold as the progression of the painting is followed counter-clockwise around the room, from spring to summer, then on to autumn and the approach of winter. The spring and summer scenes meet in a corner, where Eitoku has drawn a large boulder: The lifelike depiction of waves splashing on to the rock from both sides creates the illusion of water spraying out into the room! This illusion is just one example of the way Eitoku intended to stimulate the viewer’s imagination. When this same work is viewed in its original setting in Jukoin, the onlooker can visualize the painted river flowing beyond the boundaries of the screens and on into the karesansui (dry landscape garden) that lies just outside the room. There is a creative continuity between real and artistic space. Most of Eitoku’s multipanel works — many of which found a home in the castles of famous warlords — were executed in the Momoyama Period (1573-1600). Indeed, the vitality and three- dimensionality of the art of this period has been attributed to Eitoku’s pioneering influence. Unluckily, those of his works installed in castles were destroyed in battles during the turbulent years of Japan’s feudal era. 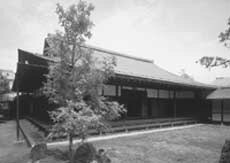 Fortunately, though, Jukoin Temple escaped the ravages of war and thus has the distinction of being the repository of the only large-scale fusuma paintings by Eitoku to have survived. In addition to these treasured artworks, this exhibition includes a prized possession once belonging to Sen-no-Rikyu: a pottery jar used to store tea leaves. 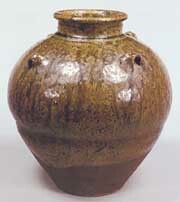 Imported from China, the jar’s liquid brown glaze and coarse clay give it the air of rusticity that characterized Rikyu’s practice of the tea ceremony. Contrasting with the vessel’s simplicity, however, is its resonant name: “Hashidate,” or heavenly bridge, after the eponymous scenic site on the Sea of Japan. The base of the jar reveals the signature of Rikyu, evidence of a curious episode in which the renowned warlord Toyotomi Hideyoshi (1536- 1598), an ardent devotee of the tea ceremony, tried to acquire some “memorabilia” from the tea master — namely “Hashidate” itself. Not wanting to surrender the jar, Rikyu hid it at Jukoin, and later willed it to the temple in a letter displayed alongside the contested container. Kano Eitoku and Sen-no-Rikyu both wrought important changes in Japan’s artistic sensibilities, and Jukoin has the distinction of being witness to them. This marvelously assembled exhibition quite literally invites you to step into its world, to savor the atmosphere of Kyoto’s Zen Buddhist temples and admire the city’s master artists.